Ever had food so awesome that if you were to get hit by a bus on your way out of the restaurant, you can truly say that you die happy? It happened to me yesterday. Not the hit by the bus part, but having the food so good my life is complete part. 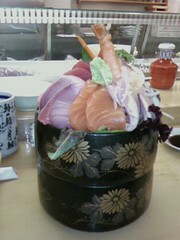 My boss/good friend Nhien took me and my coworkers Celeste and Pat to Sushi Go 55 in Little Tokyo. Voted best sushi in 2005 and 2006, this place really does have good stuff. What they're famous for is their $15 Chirashi Sushi Box. According to their website, this double stacked, round bento box is packed with "assorted sashimi, tamago yaki (sweet egg omelet), shitake mushroom, fresh green seaweed, fish cake, yamagobo (root vegetable) on top of shredded daikon." 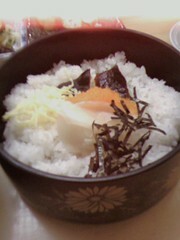 In the bottom features "shredded egg omelet, toasted nori seaweed and ago on a bed of sushi rice". For all means and purposes, I'd still call that box, "Heaven". 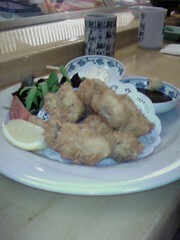 We also ordered appetizer plates of mixed tempura and the Oh-so-divine panko crusted fried oysters. Pat, not big on fish, ordered teriyaki chicken lunch. I stuffed myself silly at this place. I mean, I ate all of my sashimi (except for one slice of the egg and fish cake) plus a few extra pieces of mackerel and octopus from Nhien and Celeste. They were totally amazed at how much I could eat at Sushi Go 55. I mean, I NEVER eat that much anywhere else. I don't know what it is but when it comes to Japanese food, I seem to have the ability to pack it all in. With our bellies full of fish (and chicken), we moseyed downstairs to pick up some divine creation that is cream puffs at Beard Papa's...to go, of course. We still have yet to show up on the day to taste the super good looking fresh strawberry cream ones. But there will always be another visit to the mall, another occasion to feast at Sushi Go 55. That shirashi look ridicuously good. For $15?...such a steal. Next time visiting LA, I will have to check this place out. I spent so much time eating at the restaurant owned by my brother's friend on Hollywood Blvd opposite Sanam Luang Cafe.